The Dietary Guidelines Advisory Committee on Friday emphasized the need for the group to institute "population behavior change" in order to engineer healthier Americans. DGAC Chair Barbara Millen said the upcoming report would serve as the "foundation for public policy and food nutrition, physical activity, and health-related areas." 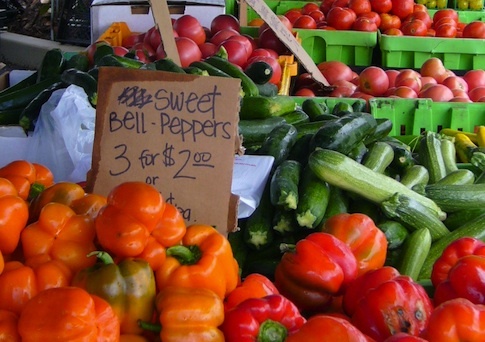 The group will release new recommendations for federal food policy in the 2015 report. Millen said the "potential is vast" for their recommendations, which deal with everything from "sustainability" in the food supply to "carbon footprints," food deserts, alcohol consumption, and obesity "interventions." "From our food programs, WIC [Women, Infants, and Children], SNAP, and so forth, and the services that are under the jurisdiction of Health and Human Services, including the Centers for Disease Control, the National Institutes of Health, the U.S. health care system, as well as the public health system, the potential impact of the policy recommendations that emanate from our report are considerable," she said. "We have an overweight and obesity epidemic," she said. As a result of this "epidemic," the committee is focusing on ways to change Americans’ eating habits. While discussing attempts to "[reduce] population disease burden," Millen displayed a slide that offered some insight into what the committee will recommend. Included in the list were: "moderate alcohol use," "improve diet and physical activity patterns," and "individualize lifestyle interventions." Millen said these are "all within the purview of the Dietary Guidelines Advisory Committee." She also said the committee must be aware of "the importance of being culturally sensitive in developing effective interventions" and look into the "home-food environment" and "screen time" for how they influence behavior. Millen added that the committee will "delve deeply into" social and environmental factors that "influence behavior," including "different dimensions of diet" and "patterns of leisure and work activity." "Key theme, in terms of the 2015 dietary guidelines, is not only understanding the complexity of the influences on diet and physical activity, the complexity of relationships between diet and physical activity and health outcomes, but what works from an evidence-based standpoint in terms of changing lifestyle behavior to most effectively impact overall health," she said. There are five subcommittees within DGAC, one of which deals with "food sustainability" for the first time. During this discussion at the meeting on Friday, Miriam Nelson, a member of the DGAC committee, emphasized the need for the committee to focus on the environment. "Footprint, you have to actually look at the whole footprint from the farm to fork, so to speak," Nelson said. Nelson emphasized that current European research has strongly encouraged "more of a plant-based diet" to address ecological sustainability, but said it is "not strictly a vegetarian diet." "[There is] remarkable alignment with the current guidelines," she said. "I’m not saying Americans really eat that, but the guidance is there." At a previous meeting, Nelson said "eating more plants" and "fewer animals" is important to reducing America’s carbon footprint. Subcommittee Four, "Food and Physical Activity Environments," is exploring "the best ways of influencing the diet and physical activity of populations," Millen said. "Here we’re looking at food access, we’re looking at a variety of settings where research is reasonably well-developed, school, child care and worksite settings, again, to identify models for effective population behavior change," she said. "And also the topic of food marketing and how that may play in terms of population behavior change." Cheryl Anderson, a DGAC member, mentioned food deserts and "food swamps." Another member, Mary Story, a professor at the University of Minnesota, said she has been looking at the relationship between "community food access" at convenience and corner stores in relation to individuals’ "dietary intake" and "weight status." One example of a behavioral intervention was highlighted during the morning session. Deborah Tate, a cognitive-behavioral psychologist at the University of North Carolina’s Gillings School of Public Health, suggested ways the government could use text messages to get people to stick to their diet. Tate’s presentation, "Behavioral Strategies and Delivery Approaches to Changing Diet and Activity for Weight Control," offered example texts that could be sent to obese people. "Remind yourself of your motivations for losing weight. If you are finding it hard to stay motivated, write down one reason you want to lose weight," one read. "Try to eat high fat foods less often. This is a good way to cut calories," said another. And finally: "There are 1440 minutes in a day. Try to find at least 10 to exercise!" Tate received $1,227,995 from 2002 to 2005 from the National Institutes of Health to study "Internet behavior therapy for treating obesity." Her findings for a trial "Text Message–Based Intervention for Weight Loss" were that text messages "might prove to be a productive channel of communication to promote behaviors that support weight loss in overweight adults." In addition to Tate’s research, the NIH also spent $1,479,072 between 2009 and 2011 for a separate study, "TEXT4DIET." This entry was posted in Issues and tagged Government Spending, Government Waste, Obama Administration. Bookmark the permalink.